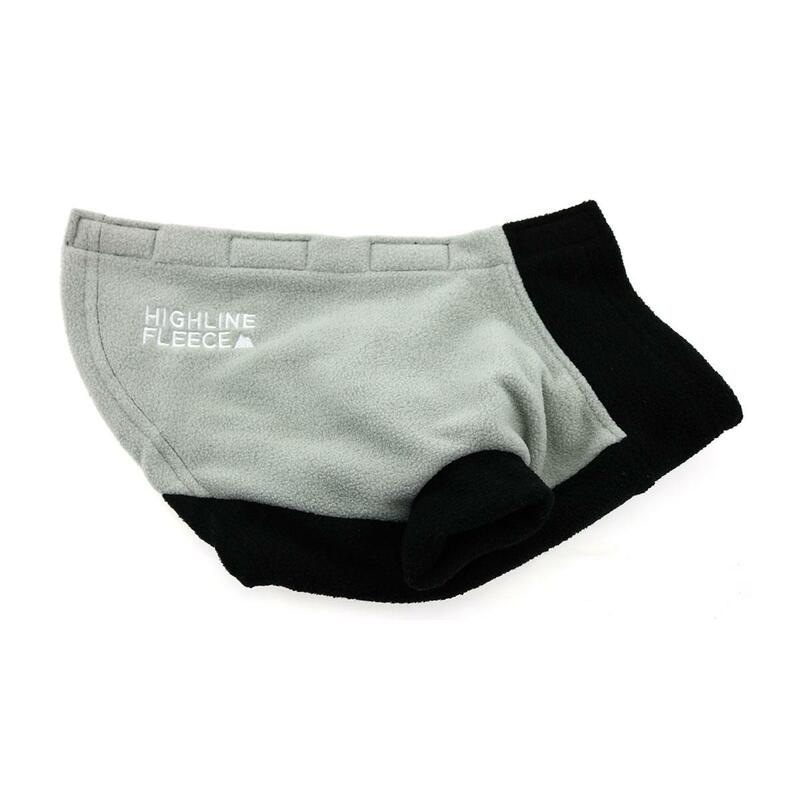 Keep your pup cozy with our new Highline Fleece Dog Coat in Gray and Black by Doggie Design. The new step-in Highline Fleece dog coats are simply perfect and perfectly simple. Designed with ease in mind for both human and canine alike, after slipping the front paws through the coat, attach the touch fastener tabs at the top and you’re ready for the park. Made from a thick 280-gram fleece, these coats will keep every pup comfy and warm this fall and winter season. The touch fastener tab design across the back makes it easy to adjust fit and attach a leash to a harness or collar underneath. The Highline Fleece dog jackets are available in 6 color combinations to choose from and come in sizes that fit every breed from 3 to 150 pounds. For broad-chested breeds, look for the "BC" designation on the size chart. Highline Fleece Dog Coat by Doggie Design - Gray and Black Customer Photos - Send us your photo! Posted On 12/10/18 by Sandra B from Sandston, VT Yes, Sandra B recommends this product! I bought 7 of these wonderful fleece jackets in different sizes. They are comfy and warm. My dogs love them. I love the high cut tummies and the easy velcro closures. The space between the velcro is perfect to hook the leash. THE SIZES ARE VERY ACCURATE. Posted On 12/04/18 by Alex from Seattle, WA Yes, Alex recommends this product! Highline Fleece Dog Coat by Doggie Design is easy to wear and very comfortable for the dog. The sizes are very accurate. The cut is perfect for little boys who have little accidents on their other sweaters. The velcro closures are convenient and the leash fits nicely on the harness or collar. It is cozy and warm. Just the best jacket ever! I bought 7. My mixed Lab enjoys the warmth and I enjoyed the easy on and off , too! Posted On 10/25/18 by Mary J from Naugatuck, CT Yes, Mary J recommends this product! I got the blue last year and loved it so much ordered the Grey and black. It fits great over my harness and looks great on my pittie. The price is great and would buy more for sure. Posted On 11/26/17 by Sarah from , Yes, Sarah recommends this product! Nice coat. Made very good. Unfortunately to small in chest. Need LC. Posted On 11/17/17 by Heather C from Fort Wayne, IN Yes, Heather C recommends this product! This jacket is super soft and warm for my little puggy! It fits him perfectly, and it keeps him warm for our cold walks. Posted On 11/13/17 by Jean M E from Trenton, NC Yes, Jean M E recommends this product! These are wonderful and they keep the belly warm and dry as well as the rest of the dog (except the legs/feet). The only thing is that the dog can sometimes get their legs out of the leg holes into the coat so shouldn't be left on if you are not there to observe. This is a great dog coat. It washes up nicely and keeps it's shape. It is soft and my little guy moves easily. The little sleeves are just the right length. Prompt service, packaged well, great prices.